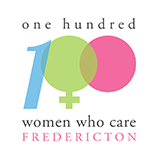 100 WomenWhoCare changing the lives of Frederictonians. Nestled cozy in downtown Fredericton at the Crowne Plaza, the 7th meeting of 100WomenWhoCare-Fredericton will be on Tuesday, March 17th, 2014. Three charities will speak about their needs and desires they would like our help with. Bring your mother, daughter, sister and neighbour and watch what a group of women can do for their community!